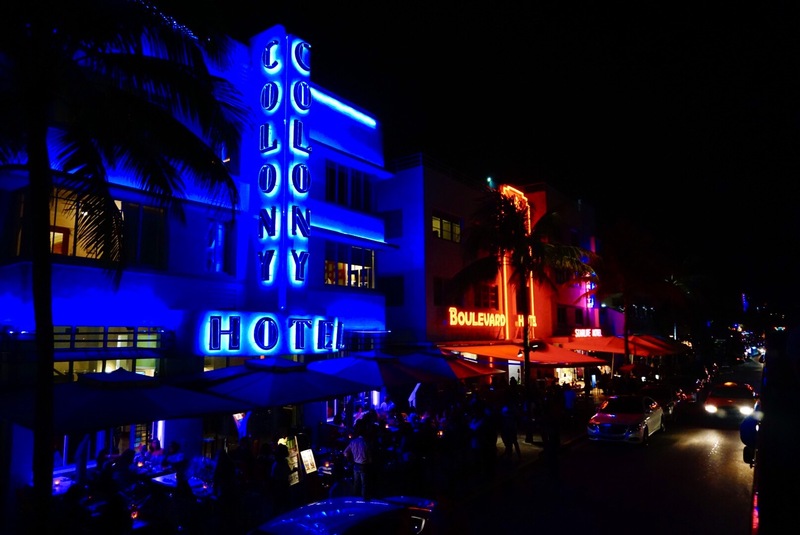 Miami Beach, the most beautiful place I’ve visited, for nightlife. After a rainy two days in Miami/Miami Beach I was losing hope that I would be able to fully appreciate the city- with many people indoors, the beach deserted, and the only hint toward uniqueness to the many places I’ve gone being the various types of people, a melting pot of every ethnicity imaginable. My hope was regained while taking a night bus tour that would cross into Miami, Miami Beach, the business district, pointed through the islands of the rich and famous, and the most important… Ocean Drive. Until Ocean Drive, the skyline of Miami and Miami Beach were quite beautiful, and while driving through the business district I realized why the city was drawing me closer, it was is its close resemblance to Chicago. A city I’ve learn to love due to its close drive to home, its skyline, food, people, and museums. But, when turning on to Ocean Drive, I experienced why so many people speak of Miami, why it’s a part of many songs, and why so many people come back. The nightlife. When we first turned left on to Ocean Drive, you could hear the faint sounds of the waves hitting shore in the distance, smell the aroma of food that was drawing nearer, see the sights of couples hand-in-hand along the sidewalks, and patches of sand to the right where the sounds of the waves hit. As we drove for another .5 miles, the tour guide informed that the reason people come to Miami is not to go the ocean, the ocean is found in many places, but it’s for the nightlife and cued us up for the next 2 mile strip. After the bus tour, we (Matt, mom and I) did go back to Ocean Drive to stop at Mangos a bar on the strip, that had life music and dance performances, and what looked to have the most people dancing and the largest mojitos. We didn’t know then, but we certainly know now, that the food was as good as the time we had, and a memory that will stick out in my mind being one of the best nights I’ve ever experienced.